The painting was first exhibited in the famous “Salon of the Outcast”, which was opened on May 15, 1863 in Paris by Emperor Napoleon III, who wished to be known as a defender of freedom and creativity. Then the jury rejected many works by artists who were not allowed to participate in the exhibition. 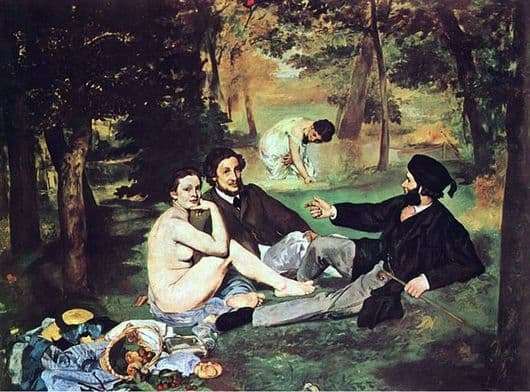 Edward Manet offered the Salon of the Rejected for dessert his Breakfast on the Grass, which caused a storm of emotions, the cruelest criticism and the unanimous sentence that this breakfast was absolutely inedible. Especially, the public was outraged by the fact that decently dressed, shod, gathered around the forest glade, with ties and with walking sticks, men, beside which naked female bodies shine. The name of the painting takes on some piquant meaning, especially since nothing edible is really depicted. The left foreground corner contains a faint hint of food, but it is clearly visible that on a piece of cloth, perhaps someone’s dress, there is a half-empty basket with several mushrooms, and several green berries are visible on the green leaves. That’s the whole breakfast. Two fairly young men sprawling freely on the grass, talking about something animatedly. The one on the right, gesturing, tells something interesting, funny, because the interviewee is smiling sweetly. An embarrassed smile glows on the face of the woman sitting next to him. Under it, a crumpled light blue fabric, a woman herself in a free easy posture sits absolutely naked, not too young, a little plump. The couple, sitting side by side, have the same hair color, they are of the same age, possibly their spouses. The second woman in a light, free, white shirt is seen a little further, but she can hear the conversation, it is clear from her that she listens and smiles too. The picture is full of light peace, warm bliss. Zola called the canvas durable flesh, modeled by streams of light simply, truthfully and shrewdly.